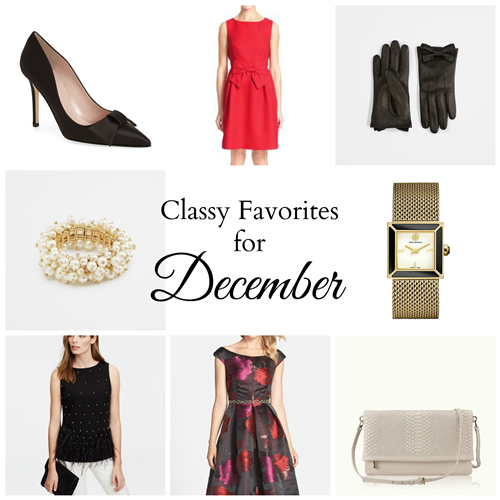 For December's Classy Fashion Favorites I wanted to focus on pieces for the cold temps, holiday parties and providing lots of ideas for New Year's Eve since it's just around the corner! Winter calls for pops of sparkle, bright + cheery color and embellishments such as bows, gold accents, feathers and metallic detail to name a few. Any of these items would also make for the perfect gift too! ANTHROPOLOGIE // 30% OFF candles, throws rugs and more! LOFT // 50% OFF winter wear + 40% OFF everything else! NORDSTROM // Offering FREE delivery by Christmas Eve throughout the U.S. It's not to late to order online, most retailers have deemed today to be a cutoff date to ensure your gifts arrive by Dec.24th using standard shipping and many are offering FREE shipping also with no minimum amounts. If you're making purchases online after today you'll want to use express shipping. If you're shopping late in the game, as you can see from my list above, there are a lot of deals to be had! 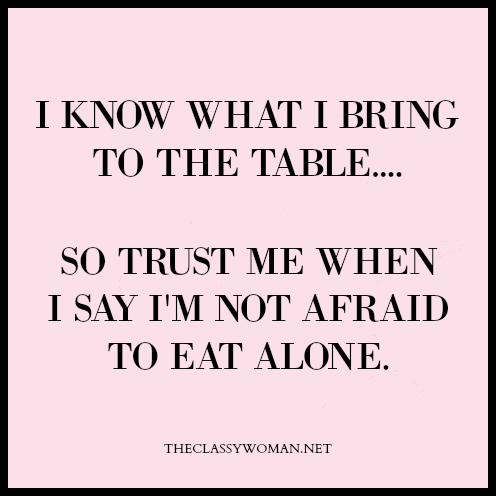 Over the years (especially while dating), I've always determined that I'd rather be alone than in bad company. What I've found is that when you learn to enjoy your own company, spending time alone isn't something to fear, it's actually enjoyable. Today's similar quote comes not from a place of cockiness or arrogance, but rather a strong sense of personal self worth. We may not always feel 100% confident in every single life situation (I know I certainly don't!) but when we truly know who we are as women and what we have to offer, we'll refuse to settle for less when it comes to job opportunities, friendships and romantic relationships! This comes in many forms of example, at the end of the day though, it always boils down to respect. We can't expect it from others if we don't give it to ourselves first. Without even realizing it sometimes, we teach others how to treat us. This isn't to say that others' negative actions towards us are our fault per se, but we often contribute to the situation when we choose to turn a blind eye or tolerate what we know we shouldn't which inevitably ends up perpetuating the problem. Sometimes women feel they don't deserve better (won't find someone better or anyone else to love them) so they stay in an unhealthy relationship. Other times women tend to stay in a job they are comfortable with because they've worked so hard to get where they are and have invested a lot of time, still holding out hope that after being turned down for a promotion year after year as their boss doesn't recognize their value, that next year just might be the one. We must be strong enough put a plan in place and walk away from a bad situation whether it's an emotionally abusive mate, unfair or belittling coworker or even a friend who has repeatedly taken us for granted. Should you find yourself struggling to see your own self worth, take a few minutes and sit down with a blank page and write down your accomplishments, note what you excel at, what you enjoy, how you help others, what others have complimented you on. Find the good, focus on it, meditate on it and speak to yourself in a manner that builds up your confidence in who you are vs. tear yourself down. Months or years of listening to the wrong people who don't uplift would leave anyone feeling less than worthy. Above all, we must remember that God loves us, believes in us and created us all for a unique purpose. No matter how you've been treated, or what you've experienced, you can rise again with renewed hope. Spend time getting to know yourself in a greater way, this often involves spending some time alone away from the noise of this world, nature is always a great place to be still and hear our own thoughts. Be exact in what you want, what you don't want and who you are as well as who you want to become. Only when we have a clear picture of where we're headed, can we reach our destination. Become the expert on yourself because nobody else will ever know you the way that you know yourself. Only when we know ourselves in a deep way can we feel the worth that we possess. A classy woman knows her self worth and if she feels as though her foundation has been shaken, she takes the necessary time to rebuild as one would do after a natural disaster. Of course, spending time with those who uplift, inspire, encourage, love and bring happiness into your life, is a sure way to feel better about who you are and help you along your journey. How do you build and protect your self worth? I hope you all had a fabulous weekend! Can you believe we're just 10 days away from Christmas Eve? Whether shopping for your mom, sister, best friend or another classy lady in your life, I've rounded up some of my favorite picks. I'm a huge fan of practical gifts that people will actually use and all of these fit the bill, plus they're perfect for women of all ages and at a variety of price points no matter what your budget is. If you were thinking of getting a special someone a gift certificate to a spa, instead of a one-day trip, might I suggest the clarisonic skincare system. I own their Mia facial brush which I've shared before and use it a few times per week and it's like having a mini facial each time, leaving my skin so soft + clean. The set above also comes with their new pedicure brush too which will help her feet stay pretty in-between trips to get her nails done-she'll have tools she can use anytime, anywhere for years to come. A lot of women I know of swear by this clipless curling wand system for beautiful waves. It's definitely on my own wish list as my curling iron recently broke. This gorgeous red bow bag above is gorgeous and it's a newly released design that is also available in black-it's the perfect size! Most of us have the best intentions to get a full 7-8 hours sleep, then we decide to check our e-mail one last time or reply to comments on social media and next thing we know it's an hour later and we're heading to bed later than anticipated, making getting up in the morning that much more challenging. Especially while away on vacation (as many head somewhere warm during the winter in hopes of a little R & R), it's easy to find yourself overtired from a day spent exploring a new city, adventurous activity or adjusting to a new time zone. While it's necessary to carve out those precious 7-8 hours for proper rest, what we do before we head to bed is just as important (if not more) to ensure a restful night of quality sleep ahead. A classy woman makes wellness a priority. She knows that only when she takes care of herself first can she then take care of those around her. 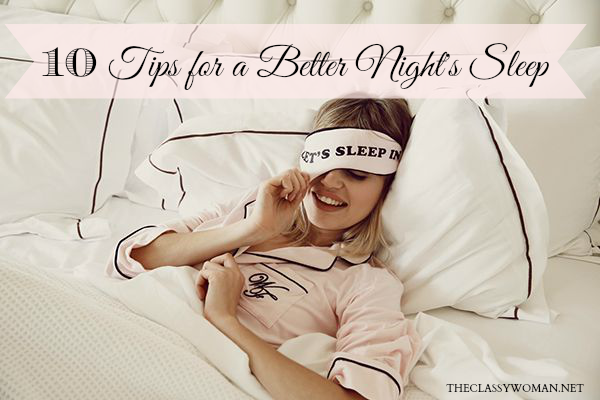 Today I want to share 10 tips that will help you get into a healthy routine and allow you to experience a better night's sleep, not only during the holidays but all year round. It is so important to get enough shut-eye if we plan to be productive, rev up our immune system as well as stay alert and happy. These are all tips that I live by and they really work! As a mother to a little one, my days are always action-packed starting from the wee hours of the morning when my eyes are barely open, and never has sleep been more cherished than when Lily was in the new baby stage and now during her toddler years. I'm also a huge fan of daytime afternoon naps on weekends when she naps-even 20 minutes can be so rejuvenating! 1. Cut off Caffeine- Early mornings can sometimes call for a boost to get things going. Many turn to coffee, tea or even hot cocoa for a pick-me-up. The trick is to get these drinks in earlier in the day then cut them off around 3pm. It's been proven that any caffeine consumed later than this time could keep you awake. If you're more sensitive to caffeine (like myself), you may want to limit yourself to one cup of joe before noon or try tea instead, chai is my favorite. Be aware of other foods and drinks that also contain caffeine such as certain herbal supplements, protein powders, energy drinks and even dark chocolate. My favorite way to begin most mornings is with a smoothie (if you've been following along on instagram you've likely seen me post a few of them already). My usual recipe is to toss a banana + frozen berries into my Vitamix blender (which pulverizes everything including seeds and powers through stalks of kale in seconds) along with orange juice, spinach (or kale) and fresh ginger for an extra zing. Adding quality protein (I like this hemp protein powder or these hemp seed hearts because they're plant-based) will keep you from feeling sluggish and will nourish your body to give it the proper nutrition, energy and essential fats it craves. 2. Limit Liquids Before Bed-Staying properly hydrated is essential throughout the day: 8-10 eight ounce glasses of purified water are what you want to aim for (essentially a glass every hour). However, if you tend to eat and drink late at night, there's a greater chance that you'll be woken up in the middle of the night with a full bladder. The best thing to do is finish your last glass of water/beverage, bowl of soup, etc., 2 hours before heading to bed. This is one of the easiest fixes for getting a more restful and longer span of sleep. 3. Magnesium is a Must-If you do not currently take a multivitamin (and even if you do), chances are that you are not getting enough magnesium. It's been studied and proven that more than 80% of Americans do not get enough magnesium in their diet due to our soil being so depleted. What you may not realize is that magnesium is responsible for roughly 200 different bodily functions and one of those is relaxing muscles for restful sleep. This is especially important for people who have twitches, restless leg syndrome or find that they have a hard time falling asleep, staying asleep or just relaxing in general. This powerhouse of a mineral is critical but not just any form of it will do. I highly recommend straying away from drugstore or grocery store brands, opt for a health food store that will provide a quality supplement or you can shop online. I buy most of my supplements online here because they ship quickly and are usually the best price. The forms of magnesium you want to look for specifically which are rated as best absorption are: Magnesium Glycinate (this is the exact supplement I take), Magnesium Taurate and Magnesium Malate, Magnesium citrate is good and inexpensive also but can cause a laxative effect (a good option if you require that) but not so much if you're very regular. As with all supplements, especially if you are using prescription medication, clear it with your doctor first. In most cases though, prescription medications can actually rob our bodies of this necessary mineral, making that much more necessary. 4. Take a Relaxing Bath- This is probably obvious to most, hot water is relaxing to our muscles and a hot bath just feels so good, providing a more drowsy state. To maximize this time in the tub, instead of bubble bath, opt for epsom salts which are a form of magnesium (magnesium sulfate), they help to not only relax but detox the body of pollutants too. One of the most simple bath recipes is: Run a tub full of water and add 2 handfuls of epsom salts, 10 drops of pure lavender essential oil (organic is always best), then add in 1/2 cup of baking soda. These up the relaxation factor and assist with detoxing the body before bed. Although quick & easy, if you're not into making your own bath soaking salts, I recommend these calm soaking salts or these detox soaking salts for yourself or even as a gift for someone who loves a good bath, they come in a pretty glass jar. A good soak for 20-30 mins coupled with a book in bed for 15 minutes afterwards always does the trick for me after a stressful day. 5. Read a Real Book- In an age where everything is digital and even our books are on electronic devices, it's import to allow our body to have a break from the EMF radiation and bright screens of tech and allow our eyes to rest themselves on the printed page. If your goal is to read several chapters, you might find yourself falling asleep after the first few pages-it's one of my favorite ways to end the day. It's been proven that starting at screens keeps our body wired and awake for far longer, for that reason alone it's important to leave electronics out of the bedroom. Opt for books that are relaxing in nature, inspiring and positive leaving you with sweet dreams. I often read my devotional bible before bed as a wonderful way to end the day. 6. The Right Temperature- While it's tempting to slip into bed and blast the heat on a cold winter's night, or run the A/C during warmer months, once your body is asleep it's natural temperature will cool down slightly. Having said that, running a space heater or covering up with too many layers of blankets can cause you to wake mid-dream to strip down or turn off the heat. The ideal temperature is said to be 72 degrees. A hot water bottle or rice pack that's able to be heated is great because it doesn't stay hot all night, just enough to allow you to drift off. I personally find I sleep much better in cooler, drier climates-it's very refreshing. My face also never looks puffy in the morning when I follow this temp guideline. A great down duvet comforter is excellent at regulating temperature so you're warm enough in winter and cool enough in summer. If you're allergic, try this down alternative duvet comforter instead. 7. Clean Sheets- We all love the feeling and scent of freshly laundered clothes, they just feel so clean and cozy. When it comes to sheets, without fail, I've always personally noticed that I sleep the best the night I change my sheets, especially if they're fresh out of the dryer. I only use natural-based laundry detergent because most fragrances irritates my skin and I omit dryer sheets and fabric softeners in favor of vinegar in my rinse cycle-this is especially important in summer when skin is more exposed. Ideally, you want to switch sheets out once per week, more often if you or your significant other tends to perspire a lot. I wash pillowcases much more frequently to keep my skin clear as I wear botanical oil serums on my face at night. Cotton sheets are best for breathability, avoid synthetic fabrics like polyester and satin or sateen. I always buy cotton sheets and use these separate silk pillowcases as they are softer and don't leave wrinkles on my face (I'm a side sleeper) and my hair isn't a mess or damaged from friction in the morning as it can tend to become with regular pillow cases. 8. Daily Exercise- Make exercise part of your daily routine and you'll experience quality sleep. This happens for a few reasons: the obvious exertion of energy during the workout causes our body to crave the necessary rest to repair muscle tissue, stretching or yoga are especially beneficial-when we stretch regularly, we eliminate muscle tightness, stiffness and discomfort, which can be especially noticeable in the evening. I've found that it makes a huge difference in the way I feel-for that reason stretching both morning and evening for 5-10 minutes is a must for me. I love this roller tool (also mentioned in this post about posture) in conjunction with regular stretching to get all the kinks out. When I've done all I can do and my neck is still stiff, a trip to the Chiropractor always re-aligns my body so I can rest without pain. Massage therapy also works wonders and should be a regular part of your routine, especially if you work out. 9. Sleepy Time Tea- I mentioned above not to drink within the 2-hour window before bed, however if you can, try to swap out water and make that last drink a non-caffeinated herbal tea designed to help you relax. Chamomile is a go-to for many. I've tried and love the following organic teas: nighty night tea, relax tea, night time tea and bedtime tea. If I'm soaking in the tub, I usually drink a mug of this at the same time, provided that it's not immediately before bed. 10. The Dark Side- Visible light in the bedroom is the primary reason why many don't sleep well. It disturbs the body's natural biological clock and circadian rhythms as well as affect our melatonin levels which tells our body that we should be awake instead of asleep. To remedy this issue, first and foremost, use curtains over windows with blinds, preferably blackout curtains. Have an eye mask on hand while traveling so you can get the same experience while away from home. Unplug or cover the display of any devices that emit a red, blue or green LED light-alarm clocks are notorious for this. In my house we just cover with a dark fabric. While we're on the subject of senses-keep flowers, scented products such as candles and air fresheners etc., out of the room which can cause allergies and wake you during sleeping hours by sneezing. If you're a light sleeper and hear even low level noise-invest in a quality set of ear plugs like these -my husband and I both swear by them at home and while traveling. They're especially useful for midday naps when outside noise is more prevalent and can be heard indoors. As a general rule of thumb, as mentioned above, turn off any tech devices that do not need to be on while you sleep such as the computer modem, laptop, cell phone, tablets, printers and more. If you have them all hooked up to a power strip, it's easy to just flip one switch and shut it all down at night. We live by this rule in our home and it makes such a huge difference in our sleep quality. What you may not realize is that EMF (electromagnetic field energy) and wi-fi continually provide a stream of radiation that has the ability alter our brain's activity and neurotransmitters. Over time, this can cause other health issues beyond insomnia or sleep problems. It is never recommended to sleep with a cell phone in or near your bed-especially not near your head or pillow. *Quick tip: If you use it for an alarm and light to see early in the morning or getting around the bedroom late at night like I do with my iPhone, just go into your settings and once you've set your alarm time, set your phone to airplane mode. As long as you don't power your phone off completely and just tap the power button to shut the screen off, your alarm will still ring but you won't be woken up by text message + e-mail alerts or phone calls either. Getting a good night's sleep is enjoyable with the right pair of pajamas. I'm sharing some favorites and most of them are currently on sale if you're looking for yourself or wanting to gift someone you love with new pair of PJ's. Use the scroll bars to see all items and click on the image to get more info. Do you find it hard to get a good night's sleep? Did any of these tips resonate with you? Perhaps you have some sleeping tips of your own that you swear by, please share as I'd love to read them in the comments below!